Dwayne Perreault − I'm fascinated by comet vintages. That doesn't make me any more cuckoo than a vintner who buries a cow horn filled with compost in his vineyard, right? Both ideas seem to me to be biodynamical in nature. Steiner in fact did write about comets, but what he had to say does not concern us here. But in a biodynamical world where the phases of the moon and alignment of the stars and planets play a role in viticulture, the idea of a celestial body like a comet having an influence on the grape harvest seems not so strange at all. What is a comet vintage? Basically, it is a vintage in which a comet which is visible to the naked eye appears during the grape growing season, especially directly before or during the harvest. This is supposed to have a propitious, perhaps even a mystical effect on the quality of the harvest. This may be folklore passed on by generations of winemakers, but in fact it is backed up by examples of outstanding and yes even mystical vintages like 1811 and 1858. The complete list of recorded comet vintages is: 1811, 1826, 1839, 1845, 1852, 1858, 1861, 1985 & 1989. These were all considered great years in regions as diverse as Bordeaux, Burgundy, the Rheingau and Tokaji in Hungary. This should of course be kept in perspective. There were many more great vintages, even in recent memory like Bordeaux 2000 and 2005, in which no comet was recorded. In fact, comets pass by the earth routinely every year, but we are talking about comets which must be visible to the naked eye, which happens on average once a year on earth, and they must appear during the growing season in western Europe. There is a strange lack of comet vintages between 1861 and 1985, the reappearance of Halley's comet. 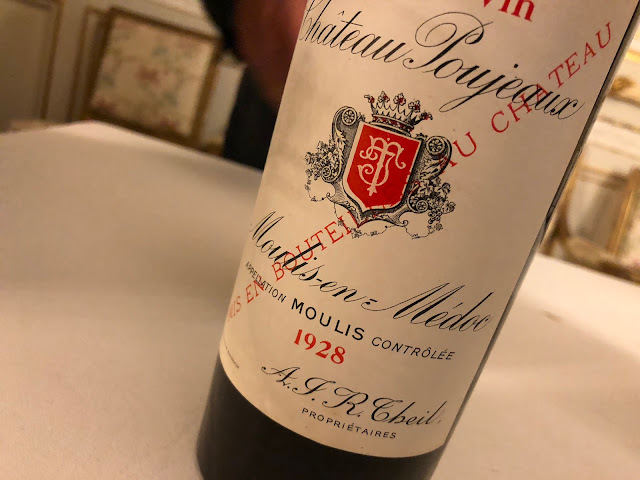 Whether the comet vintage is myth or reality, it seems to begin in 1811 which is generally regarded as the greatest vintage year of the 19th century, notably for cognac but also for western European wines in general, especially Bordeaux and Sauternes. Robert Parker, tasting the 1811 Chateau d'Yquem in 1996, awarded it 100 points, his absolute bench mark. 1811 was also the year Veuve Clicquot discovered the technique of remuage, which revolutionized the champagne industry and further romanticized the year. For the comet is not just an astronomical observation in 1811, it is a Romantic concept of the mystical cause and effect of physical nature. The Flaugergues comet was visible for most of the growing season of 1811 and coincided with (or caused?) optimal growing conditions that year. Outside of vineyards it had a less favourable aspect. The same comet was seen to be the harbinger of Napoleon's disastrous invasion of Russia and the War of 1812, America's lone failed attempt to invade Canada which led to the sacking of York (now Toronto) and the burning of the original White House. As you can see, comets have wide-ranging effects, not all of them good. The last comet vintage was 1989. Okazaki-Levy-Rudenko 1989 r ('r' means it was the 18th comet discovered that year) was first detected on Augus 24th and was visible to the naked eye in western Europe from September to November. So, what about 1989? I was recently able to get my hands on 10 bottles of St. Emilion Grand Cru Classé Clos des Jacobins 1989 for a reasonable price through Winefield's Auctioneers in Amsterdam. Back in 1989 Clos des Jacobins was still owned by Cordier, whose name comes first at the top of the label. Parker would later write "the 1989 looked to be one of the finest offerings this property had ever made." In 1989 George H.W. Bush became President of the United States of America (I repeat, comets can have wide-ranging effects, not all of them good). I admit, I couldn't wait to try the wine and within hours after arriving home, a cork had been pulled. The Dutch have a word which I find can best describe this vintage: boterzacht. Literally translated, it means soft as butter, but I’m telling you this is a wine with plump extremities: adjectives like full, round and even bacchanalian come to mind, and there remains something smoky in that glass of dark fruit. This is generous wine you can really get intimate with, and a few bottles are now available on my website. When will the next comet vintage be? Alas, nobody knows because comets come and go and they often don’t pre-announce themselves. Short term comets (with an orbit of less than 200 years) are easier to predict than long term comets (with orbits up to millions of years). So you never know which comet will come cruising up next, an old friend like Halley (1985) or an unknown like OLR 1989-r. In the meantime, before more bad stuff happens, we can enjoy this last comet vintage. It is, after all, at its peak. Quite interesting. I would have never imagined that a comet could have such a direct impact on a harvest. Yet, the reason why remains another 'biological', if not metaphysical, mystery. By the way, did you know that in the old Greece, Hades, Bacchantes used to drank either milk or water? They only drank wine in Spring when it was ready. And Dionysus wasn't the good of wine as we simply see it nowadays, but maybe the god of any seed including the grape. It was mainly represented by an Ivy. It was the Romans with their Bacchus version, before us, who absolutely distorted the notion or concept of such god. God foreign to the Greeks for it had its roots in Asia Minor as the ancient idea of euphoria that always goes along the bacchanalian rites and practices, which is far more ancient that any wine. I wrote an essay on the subconscience which deals with this topic. It's in Spanish though. A real pity because maybe you would find it interesting. Don't get me wrong. I am not denying that somehow and for millenia humans got into trance by using some sort of stimulant. Some used and still use psychotropical drugs and others just their bodies. I enjoyed the article, anyways. It's got a touch of the unknown, if this makes any sense, and that makes it kind of enigmatic. A fascinating blog - it has intrigued me! I have followed it up on my own citing yours and linking to it. 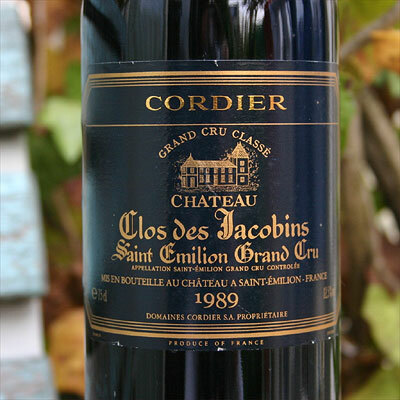 Clos des Jacobins 1989 is a super wine and St Emilion is one of my favourite appellations. Thanks for an extremely good read!